Review: The scene is set. It's dark, a little too dark. The spy music plays as out jumps…Lunch Lady?!! That's right. Lunch Lady. Usually it would be Superman or Batman. But at this school, the Lunch Lady is the hero. 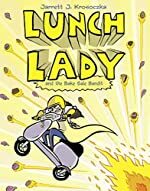 The Lunch Lady's magnificent action-packed story comes to life in Lunch Lady and the Bake Sale Bandit, written by Jarrett J. Krosoczka. Lunch Lady and the Bake Sale Bandit is the fifth book in the Lunch Ladyseries. Lunch Lady and the Bake Sale Bandit is a wonderful book. It gives me a lot of laughs. It's an action-packed story with a Lunch Lady twist. I especially love the "mirror broom" and "ketchup laser." I enjoy how the story is like a real school, where everyone loves the Lunch Lady. Lunch Lady and the Bake Sale Bandit has amazing graphics and colors. I love the design of all the characters. The author did a great job with the plot of the story. It is very realistic, but still fun and silly. Lunch Lady and the Bake Sale Bandit is a great read for anyone looking for action, adventure, and a good laugh. We would like to thank Random House for providing a copy of Lunch Lady and the Bake Sale Bandit for this review. Have you read Lunch Lady and the Bake Sale Bandit? How would you rate it?